Book now for winter 2019/20! Bookings for Polar Lights Husky Sledding in Finnish Lapland are now open for winter 2019/20! The landscapes of Pallas-Ylläs National Park in the far north of Finland are considered some of Finland's finest - the park covers over 1000 sq.km. of wilderness fell chain, ancient forest and wetland areas. Polar Lights Husky Sledding in Finnish Lapland is a dogsled adventure based at wilderness lodge on the edge of the park, with arrival/departure + 4 days' sledding. Each day you will head out to explore the National Park region, driving your own team of Alaskan Huskies. In the evening, accommodation at the wilderness lodge is simple but cosy and comfortable - there is no mains electricity or running water (drinking water is provided from the kennels), but the cabins are lit by LED battery-powered lighting, heated with wood-burning stove supplemented by oil-fired heating, and there is the opportunity for a traditional Finnish sauna by the lake to round off each day on the trail! 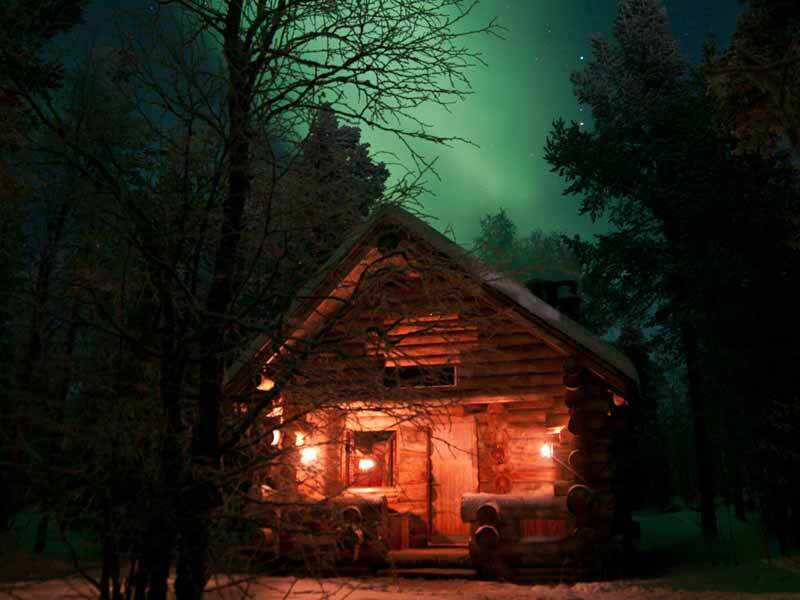 Your base for the tour is comfortable wilderness cabin and the area is ideal for Northern Lights. Photo: PH. In addition, this Arctic region is a wonderful location to see the Northern Lights, which may be seen throughout the dog sledding season - you are far away from light pollution and the wild nature of the park provides a wonderful backdrop. The wilderness lodge camp is located some distance from the kennels, offering a real sense of remoteness - when you first arrive, you will be transferred to the lodge for your first overnight, and your first day's sledding then takes from a starting point at the kennels to sled to end back to the lodge. For the following days, the huskies will also be staying with you at the lodge (sleeping outside of course) as your daily tours explore the National Park. On your last day of sledding, you sled back to end with your dogsled teams at the kennels, before returning to the lodge for your final night. 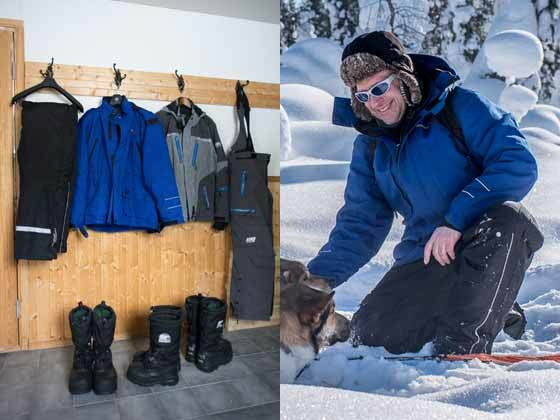 During sledding days, you will prepare the dogs and sleds in the morning and typically be ready to take to the trail around 11.00, stopping for lunch outside during the day and returning to the cabins around 15.00-16.00. Typical distance covered for a days' sledding is around 35-40km depending on weather and trail conditions (except first sledding day, when distance is typically shorter). 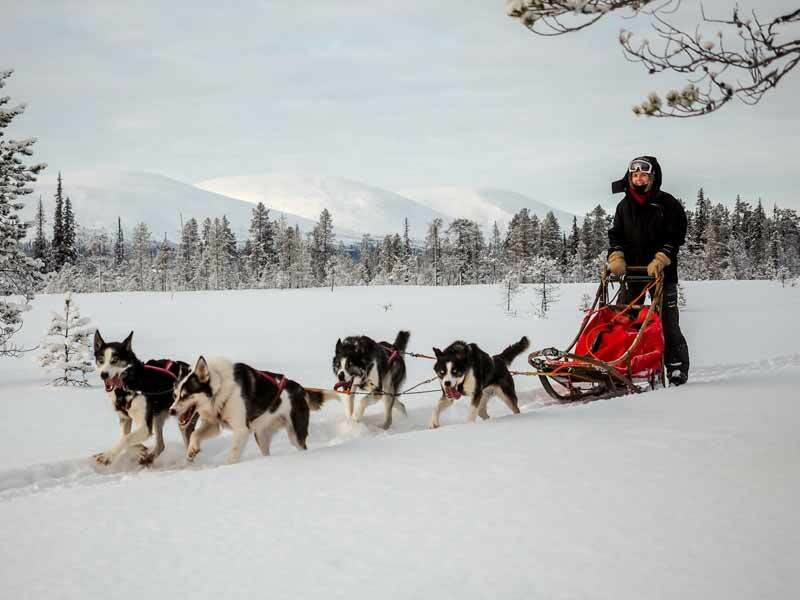 You will be driving your own dogsled team and caring for your dogs during the trip. Photo: PH. Polar Lights Husky Sledding in Finnish Lapland is a wonderful choice for a moderately-challenging dogsled tour offering the opportunity to sled in a very remote landscape, but with the convenience of a fixed base location to simplify logistics, and accommodation with a little more in the way of facilities (such as basic lighting and nightly sauna) than would be typical for a multi-day dogsled adventure. With regular tour dates from December until April, whether a solo traveller, couple, group of friends or family with older children, this should be a husky holiday to remember! Northern Lights, Polar Lights, Aurora Borealis - all terms to describe the magical shifting colours that appear in the skies of the far north and can be seen whenever the skies are dark enough (from around September to early April). This experience is located in an area giving very good chances to see a display during your tour - you are staying far away from light pollution and well inside the Arctic Circle. 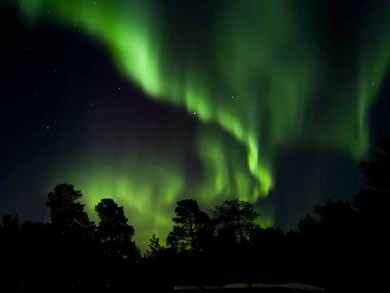 As with any natural phenomenon, a display can of course never be guaranteed - the skies must be clear, there must be Aurora activity, and you must be awake to see them! As with all our dogsled tours, you will be involved in all aspects of the trip, and this is very much part of the experience. You will assist with caring for your dog team, including harnessing, feeding (and, yes, picking up poo! ), as well as tasks around camp such as fetching water, chopping wood, preparing food, washing up, etc. Transfer (approx. 30 mins) is included from Kittilä airport. Guests normally arrive with the early afternoon flight, but arrival later in the afternoon is also possible. Guests can also choose to arrive with night train to Roveneimi + bus to Levi for collection from there. At the kennels you will be outfitted with your winter clothing for the tour and transferred to the wilderness lodge camp, which will be your base for the coming days. After breakfast, you will be transferred back to the kennels for your first day of dog sledding! 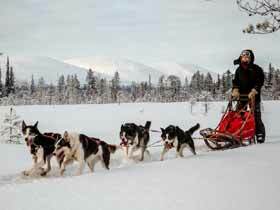 You meet the dogs and instructed in how to harness your team of Alaskan Huskies and to handle the sled. 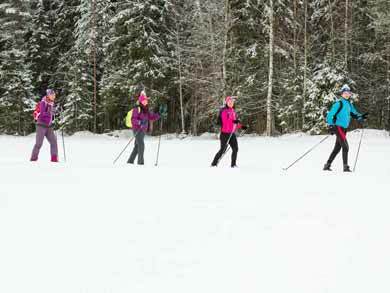 Once ready, you head off to explore the stunning landscapes of the Pallas-Ylläs area. As for your other days of sledding, you will make a stop for lunch over open fire. Your route today takes you back to the wilderness lodge camp. Here you unharness your dogs, see to their needs and make ready for the evening. Dinner is taken together in the "kåta", the wooden tipi, and there is the opportunity for sauna by the lake. If you're feeling brave, you can try a roll in the snow! Each morning you take care of the dogs and harness your teams to take to the trails once more for a new day's sledding. The Pallas-Ylläs region has beautiful landscapes of forest, rolling fjells, frozen lakes and plains to explore. At night you return to the warmth and welcoming cosiness of the cabins and perhaps a sauna to ease those tired muscles after your day's sledding! Your day's sledding takes you back towards the kennels, where you unharness your team and bid a (perhaps tear-filled!) farewell to your new four-footed friends. You will have been working closely with your team during the last days and are likely to have become very attached! You are then transferred back to the wilderness lodge to spend your last night there, with dinner in the kåta exchanging stories and memories from the trip. After breakfast*, you will be transferred to Kittilä airport for departure. Transfer meets flights departing Kittilä around 09.30 or later. Guests departing by bus + train to Helsinki can be transferred to Levi. *If you have chosen to add an extra sledding day tour this day, the tour will end in time for the evening flight from Kittilä to Helsinki. Tours normally run Sunday-Thursday, with the exception of dates around Christmas and New Year. *This tour date is 5 days/4 nights, that is one day shorter than standard tours. Extra dogsled day tour on departure day: For tours from 18th January onwards, subject to availability it is possible to extend your trip with an extra day's dog sledding on Day 6 (no overnight accommodation included). This will then end in time for transfer to the early evening flight from Kittilä to Helsinki. Five nights' accommodation in wilderness lodge, from where you will take day tours by dogsled to explore the surrounding area. The lodge camp is staffed and your local hosts will be with you during your stay there. Everyone assists with general tasks around the camp such as preparing food, tidying up, perhaps chopping wood, etc. The camp has two guest cabins with shared sleeping arrangements in bunk beds (sleeping bags are provided), offering simple but comfortable and spacious accommodation. 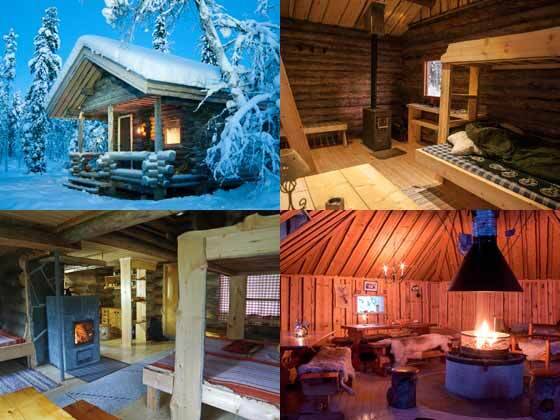 The cabins are heated with wood-burning stove and there is also an oil heater to provide heating through the night. Sauna by the lake is available each night. Lighting in the cabins is provided by an LED system powered by battery, which has USB connection to charge small electrical items such as cameras and mobile phones. Wilderness Lodge Cabins - bottom right shows "kåta" (wooden tipi) building for meals. All meals from dinner on arrival day to breakfast on departure day (breakfast, lunch, dinner + coffee/snacks, etc). Please let us know if you have any special dietary requirements. All equipment necessary for dogsled tour including sled and team of huskies. The kennel has around 55 Alaskan Huskies. Adult participants will drive own dogsled with typically 4-5 dogs per team. Warm winter outer clothing: thermal jacket and trousers, winter boots, warm hat, warm mitten gloves and inner gloves, winter sleeping bag (please bring own liner, pillowcase is provided). Please provide shoe sizes and clothing sizes in advance (smallest available sizes for winter boots is European 36 and for clothing XXS). Instruction in harnessing and sled handling. Services of local guide during the tour. Local transfers between Kittilä airport or town in connection with fixed flight times as per itinerary. You should have a general good level of fitness and enjoy the outdoors. You should also be comfortable living in close proximity with others. Recommended minimum age 16 years. Families with children aged 12 and over may also occasionally be possible on request (as sledding can take place during the day separately from other adult participants with own guide to be able to accommodate the requirements of a family). Please contact us to discuss your requirements and sledding arrangements for under 16s (participants under 16 will normally ride on guide's sled, but may on occasion be given own sled locally at the discretion of the guide if judged to be suitable). No previous dog sledding experience is required. Dog sledding can be physically demanding. You must be able to brake the sled when going downhill and also assist the dogs during uphill sections by stepping off and running behind the sled for short distances. If weight >95kg, please contact us to discuss suitability. As a 6-day/5-night experience with 4 days' sledding, this experience will typicaly have a higher level of physical challenge than a shorter tour. The Pallas-Ylläs National Park area is a remote region and the level of challenge can vary significantly depending on weather and wind conditions. However, as the itinerary is based on day tours from a fixed location, the level of challenge will typically be more accessible than tours requiring moving location, allowing you to run with light sleds during the day. Accommodation is of simple standard but is cosy and comfortable with oil-fired heating to complement wood-burning stove and simple provision of electricity. Total minimum 2 persons required for tours to be confirmed to run. You are welcome to book as a solo traveller. Max. group size 8 participants. 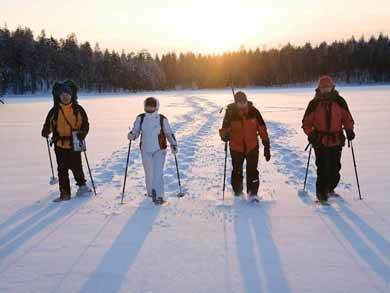 With 8 persons, the group will be divided into two to sled separately with own guide during the day. The Pallas-Ylläs National Park is Finland's third largest national park, covering an area of 1,020 sq.km. The park contains a range of important landscapes and habitats, with ancient forest and a chain of almost 100km of fells, the highest of which is Taivaskero at 807m. Fly to Helsinki for domestic flight to Kittilä (1.5 hours) or travel by night train to Roveniemi and bus to Levi (total approx. 15 hours). From Kittilä airport or Levi town, transfers to the kennels (approx. 30 mins) are included. 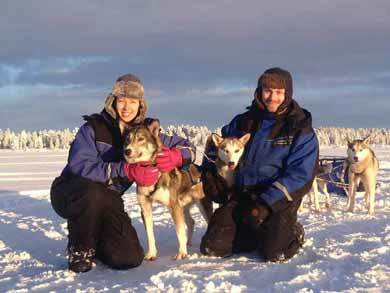 Compare our range of dogsled tours. When to go dog sledding.